Subject: Describes the history of the controversial ditch built from 1863 to 1878 to carry water for gold mining. 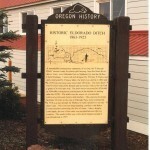 A remarkable construction enterprise of its time, the ‘Eldorado Ditch’ carried water for placed mining from the Burnt River above Unity, over Eldorado Pass to Malheur City and the Willow Creek Drainage. Conceived and designed by William H. Packwood and constructed by Chinese labor, the ditch was started in 1863 and by May 1878 was carrying water more than 100 miles. The main ditch was five feet wide at the bottom and seven feet wide at the top with a grade of 4.8 feet per mile. 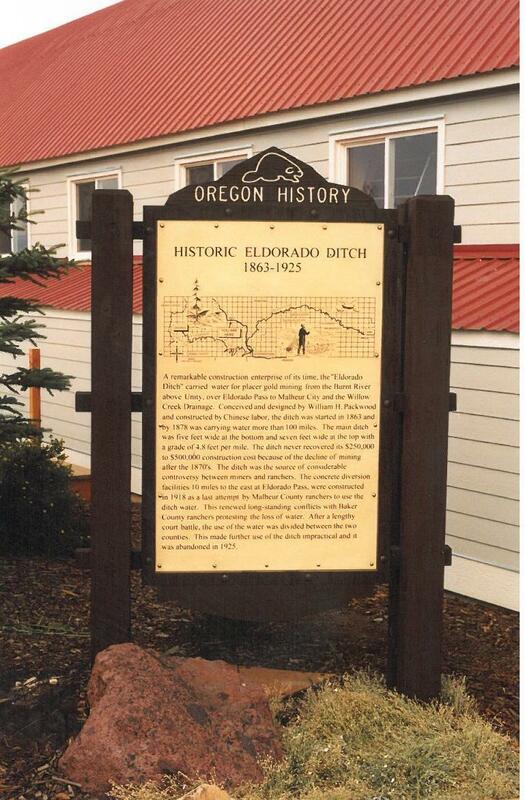 The ditch never recovered its $250,000 to $500,000 construction cost because of the decline of mining after the 1870’s. The ditch was the source of considerable controversy between miners and ranchers. The concrete diversion facilities 10 miles to the east at Eldorado Pass were constructed in 1918 as a last attempt by Malheur County ranchers to use the water. This renewed longstanding conflicts with Baker County ranchers protesting the loss of water. After a lengthy court battle, the use of the water was divided between the two counties. This made further use of the ditch impractical and it was abandoned in 1925.